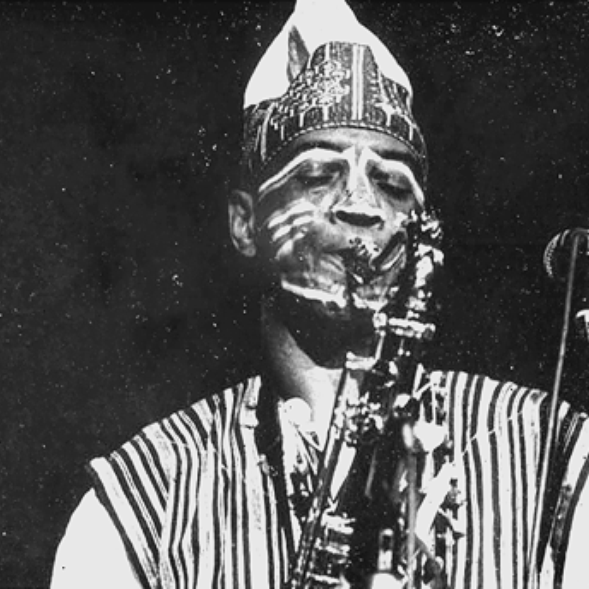 From his earliest recording, "Song For" (Delmark, 1967) - with Fred Anderson on tenor, William Brimfield on trumpet, Christoffer Gaddy on piano and marimba, Charles Clark on bass, and Steve McCall on drums - energy and freedom are the main ingredients of this highly infectious music, including the remarkable "Non-cognitive Aspects Of The City", which would become the title of an album by the Art Ensemble Of Chicago in 2006 : the piece isn't anything you've heard in music before: loose structure, no rhythm, poetry, a drum solo, and a feeling that the music can move in any direction at any moment, as if it flows without purpose or sense of direction ... and long moments of silence. And yet it's magnificent. “Sound effects came from behind the curtains, curious knocking, whistling effects, and birdlike sounds from Jarman’s flute. Jarman and Clark rushed from the curtains reading poetry in counterpoint and ringing bells. The curtains parted to reveal a psychedelic setting: variously hued lights flashed, junk was piled like Rauschenberg sculpture, clothes were strewn everywhere, giant pop-poster canvases of Ku Klux Klansmen and Alabama sheriffs hung high at stage rear … stage lights went on. A couple strolled on stage, drinking from paper cups, and the music came liced with phonic imagery. Lights flashed on an off. There was a murder, and the body, fallen amid the junk on the floor, was hauled away. (Fred) Anderson came to center stage and began a blues line. There were angry shouts from the rear of the auditorium by some of the musicians. Jarman walked onstage and picked up his horn to join the fray. (Thurman) Barker glided from meter to meter, waltzing and grinding straight ahead”. Listen also to Song For Christopher, on his second LP, "As If It Were The Seasons" also on Delmark, in 1968, a long tribute to the band's pianist who had just passed away at the age of 24. 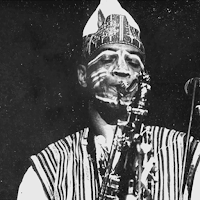 This is free jazz almost in its purest form: a twenty-minute long collective outburst of all possible emotions, yet delivered with such expressive power and disciplined freedom that it almost hurts. A tentet with all musicians playing a myriad of other small instruments next to their lead instrument, and not one second of the music is limited or constrained by conventions or possible audience expectations. Jarman's concerts were complete shows, with visual art, poetry, dance, theater and of course music. He used smoke machines, had artists walk through the audience, or actors with loud transistor radios, jugglers and tumblers. At times he only gave poetry performances, with an assortment of little bells and gongs to accompany him. It was already then that he felt attracted to buddhism - and eventually he was officially ordained in 1990. 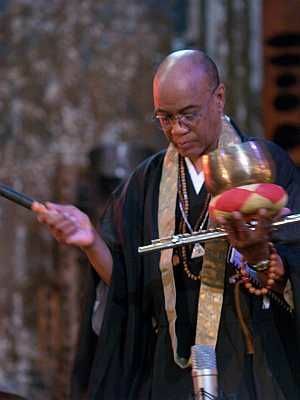 One of his first 'buddhist' performances in 1968 in Chicago was inspired by the Tibetan Book of the Dead, for which he invited his old friend Roscoe Mitchell, and in the company of two other young musicians: Lester Bowie and Malachi Favors. That was the beginning of the Art Ensemble of Chicago, and history was made. In parallel he deepened his knowledge of Zen buddhism, and of aikido, the martial art for which he had a fifth degree black belt. Listening back to Jarman's first recordings, they are still incredibly strong, fresh, modern, appealing and hugely relevant. Fans of the AEC will recognise his musical imprint on the ultimate sound of the legendary band. Jarman's music is one of endless possibilities, madness, anger and the creation of a sense of spiritual communion, not only among the band members, but also including the audience. Despite all the theatricality of the performances, the actual shape of the music, how it sounds, with all its unpolished beauty, its emotions and spiritual depth, is more important. This is not just music, it's a happening, it's a life experience, it's experiencing life. I will leave it up to our readers to follow his mostly known further career. He has always remained true to his initial musical and spiritual philosophy. Since the early 2000s, he was confronted with several recurrences of cancer, which also led to his untimely death, at the age of 81. Listening back to what he achieved, and what he meant for music, what he definitely meant for many listeners and fans, colleague musicians and of course friends and family, can hardly be overstated. Great black music, ancient to the future. Thank you for such a beautiful, evidently heartfelt and evocative piece about such a important artist. Thanks, indeed!